From Loot to Console, There's TONS of Gears of War 4 Merchandise! From Loot to Console, There’s TONS of Gears of War 4 Merchandise! We’ve been following Gears of War 4 ever since it was revealed at E3 2015. 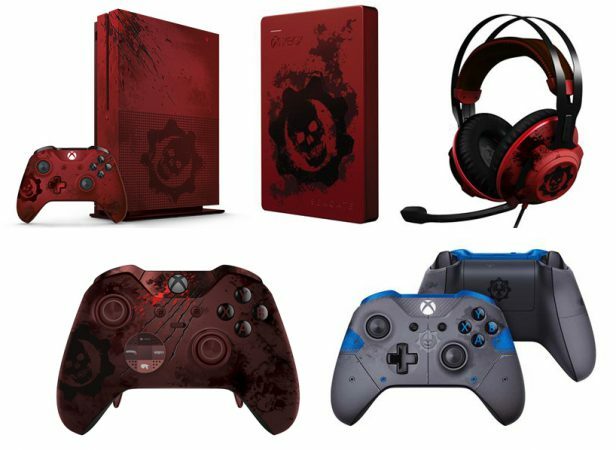 On the eve of San Diego Comic Con 2016, Xbox has detailed a plethora of amazing Gears of War merchandise! From exclusive consoles to Loot Crates, it’s definitely a great time to be a Gears fan! Now let’s dig into that merch! At E3 2016, Microsoft unveiled the Xbox One S—the smallest and most compact Xbox yet, starting at $299. Featuring a 4K Ultra HD Blu-ray player and High Dynamic Range (HDR) support for video and gaming, the Xbox One S promises to deliver richer, more luminous colors in games. [Microsoft] also announced a host of Xbox Live features and updates that will unite gamers across devices, alongside [their] biggest lineup of games on Xbox One and Windows 10. [They’re] building a future beyond console generations, letting fans play without boundaries to provide more choice than ever before on where and how they play. Continuing the collaboration between The Coalition, the studio developing Gears of War 4, and the Xbox design team, we were inspired by the idea of creating something that looks as if it were lifted right out of the game: a console that bears the battle marks of surviving a desperate fight against Gears of War 4’s ferocious new enemies – the Swarm. Advances in technology and manufacturing techniques really let us free up our imaginations. From the laser-etched scratches, to the bloody thumbprint on the controller’s red metallic D-pad and the iconic Crimson Omen, we looked closely at what we could do with every piece of hardware. Microsoft promises that the Xbox One S Gears of War 4 Limited Edition 2TB Bundle will be the ultimate Gears bundle. Beyond that, fans will also receive a host of in-game content, starting with the exclusive Vintage Oscar Elite Gear Pack, which features Vintage Oscar, the Vintage Retro Lancer, Vintage Boomshot and more. We’re also throwing in the Pre-Order Vintage Del Gear Pack plus six additional Gear Packs to make sure that fans are fully stocked. The Xbox One S Gears of War 4 Limited Edition 2TB Bundle will be available for $449 in the following markets at launch: United States, Canada, United Kingdom, Ireland, Italy, Australia, New Zealand, Austria, Belgium, Denmark, Finland, France, Germany, Netherlands, Norway, Portugal, Spain, Sweden, Switzerland, Czech Republic, Greece, Hungary, Poland, Slovakia, and Turkey. Alongside this new bundle, Microsoft debuted another Gears of War 4 custom controller that will be sold separately. An all-new Xbox Wireless Controller–Gears of War 4 JD Fenix Limited Edition designed after JD Fenix’s armor and features metallic blue accents and textured grip for enhanced controls, as well as the COG logo–the Phoenix Omen. Both controllers come with three Gear Packs containing in-game items and an exclusive multiplayer lobby emblem–a different one for each controller. The Crimson Omen and JD Fenix Limited Edition Xbox Wireless Controllers will be available for $74.99 USD starting September 13 for individual purchase in all major markets where Gears of War 4 will be sold. The Xbox One S Gears of War 4 Limited Edition 2TB Bundle, Crimson Omen and JD Fenix Limited Edition Xbox Wireless Controllers will all be available for a limited time while supplies last. The bundle is available for preorder starting today, so be sure to check Xbox.com, MicrosoftStore.com, or your retailer of choice. The controllers will be available for preorder starting on Aug. 1, and in the U.S., the JD Fenix controller will be sold exclusively at the Microsoft Store and GameStop. Now for a limited time, you can also get the entire Xbox 360 Gears of War collection for download on Xbox One at no additional cost.